After the killing of four Israeli settlers the other week by Hamas gunmen, settlers all over the West Bank reacted with counterattacks on Palestinians. 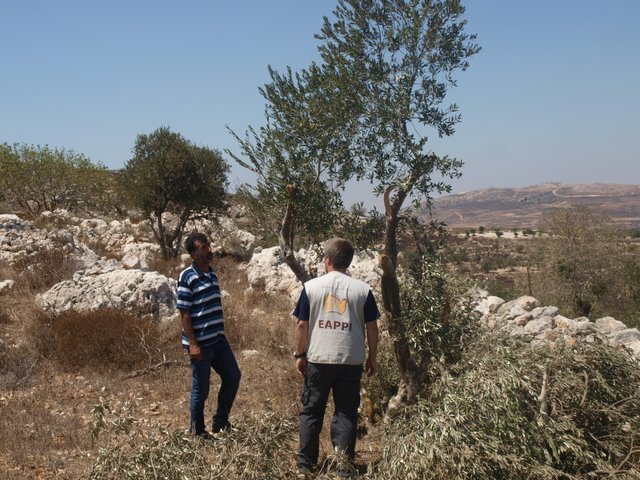 In our area close to Nablus settlers threw rocks on Palestinian cars, threatened local residents and cut down olive trees owned by Palestinian farmers. “We heard them during the night”, the nearby neighbor explained. “They had chainsaws. But we could not do anything”. Akram showed us how the settlers, supposedly from the religious Yitzhar settlement, first cut into the bigger branches of his trees and then just broke them off. All around on his field we could find the branches, still carrying the now almost dried out olives. “Look, finito, no liquid”, Akram said. And it is not the first time that this happend to him. 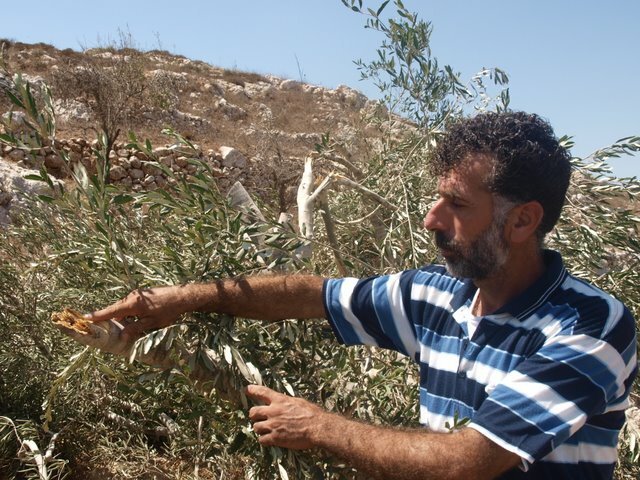 Already ten month ago settlers chopped down about eighty of his trees. So by now, like he said, Akram and his family only have about twenty trees left. And it will take years until the destroyed ones will grow back and carry the same amount of olives again. 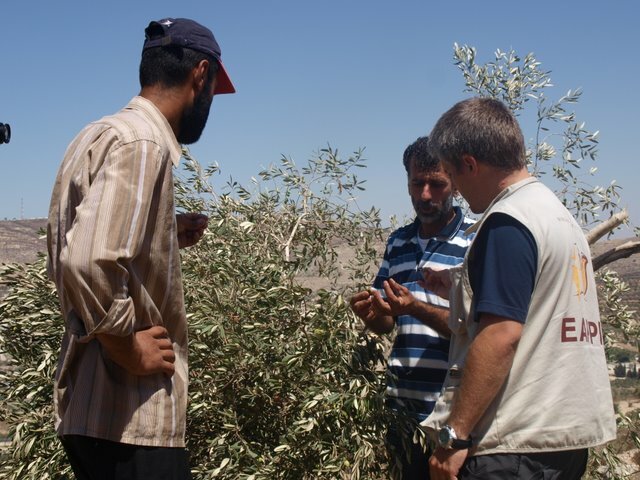 In total, Akram explained, he “lost an annual harvest of about 2000kg of olives.” Asked what this means in financial terms he took out his cellphone and using the calculator he showed us a number on the display: 76.500 NIS. Or 15.000€ – basically the only income of his family. In October he would have been able to harvest. Now he has hardly any olives left. The Red Cross reported the attack and of course the Israeli police as well as the Israeli District Coordination Office were called. But no interrogations or arrests have been made so far. Akram does not have any hope that the authorities will follow up with his case or that he will receive compensations. He lost his lifelihood while the perpretators go free. Sadly enough this is not a single story in the West Bank where the occupation created lawlessness and much to often the application of different laws for Palestinians and Israelis.